Our La Jolla snorkeling tours are available everyday. The best snorkel experience in San Diego includes the La Jolla Cove, caves and sea lions. – includes: group guide & use of wet suit, mask, snorkel, fins. 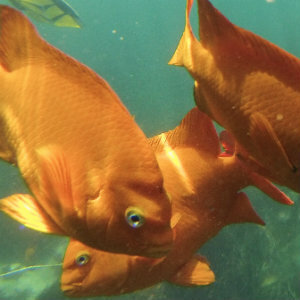 We offer a number of daily tour times for our snorkeling in La Jolla. Situated below scenic sea cliffs is the charming Cove. Known for beautiful topside views and an abundance of sea life below the surface, this area has become one of the most famous snorkel and dive sites in California. Our daily small group tours are a great experience for families and adventure seekers alike! Explore the sea life rich protected ocean area. Swim near the cutest sea lions on most everyday. View beautifully colored fish including the bright orange Garibaldi. Check out the seven awesome Sea Caves area. Tours require advance reservations. Call Today! Participants must have good swimming skills. Equipment provided includes mask, snorkel, fins and full wet suit. Groups meet in la Jolla 30 to 60 minutes prior to the event. Groups are usually in the water for just over an hour per tour. Our guides will bring all needed snorkeling gear to the site for you. Our professional, insured guides are all super fun. Each summer hundreds of leopard sharks make their way to the shallow waters off La Jolla. These beautiful sharks can often be spotted in just a few feet of water off a number of area beaches. Join one of our incredible tours snorkeling with these magnificent creatures. 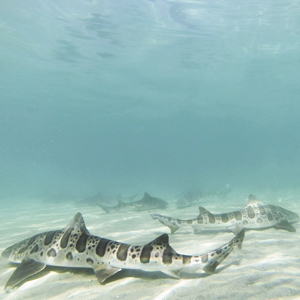 Our leopard sharks is a great adventure for the whole family. Get up close to these amazing creatures. Sometimes within feet. Be sure to bring you underwater cameras for tons of shark photos. Situated off the Marine Room, this area has gorgeous views of the coastal cliffs. Keep an eye our for the babies often swimming near their mothers. Other visitors may include a variety of rays. July through November are typically the best months to see these sharks. Call to schedule an individual or group snorkeling. Are you planning an event for your work or family? Consider booking one of our snorkel tours as a private event. Our staff will work together with you to pick a tour that works best for your groups needs and experience. Choose an afternoon with seals, sea lions and sea caves or maybe the lovely leopard sharks are more your speed. Call for additional information and special group pricing. We will also arrange private scuba diving tours for certified divers. La Jolla is a year round destination for snorkeling. Winter months tend to be a bit on the colder side but often with very good visibility. In the winter months we provide thicker wet suits to all ocean event participants. Winter is a great time to see a variety of fish. Springtime typically brings rain. We continue guided tour reservations year round. If you are arriving in the spring try to have a couple days that are optional for your snorkel adventure in case your first day of choice gets rained out. The Cove is often teaming with newborn life in the spring. In the summer months the waters off our coast tend to warm up and only a thin wet suit is needed by most participants. Sea lions and seals are abundant in the local waters during these months. Autumn is usually an amazing time to join our La Jolla snorkeling adventures. Warmer water temperatures and an abundance of sea life of the coast make this a fantastic time of year to get out on the water. Scuba and freediving events are also available with our guides throughout the year. Check our scuba diving adventures in San Diego at La Jolla Cove.